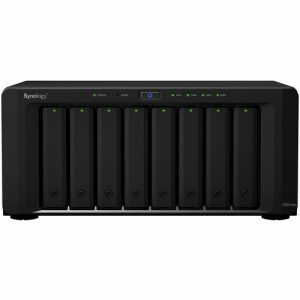 The DS414slim Diskless 4-Bay NAS Server from Synology comes equipped with four hot-swappable storage bays capable of holding 2.5″ SATA II and SATA III hard drives and solid state drives. With support for capacities up to 16TB (drives sold separately), you can store a large amount of files including Full HD video, music, photos, documents and more. This enclosure supports enhanced data transfer speeds with an average data write speed of 54.53 MB/s and an average data read speed of 110.91 MB/s. 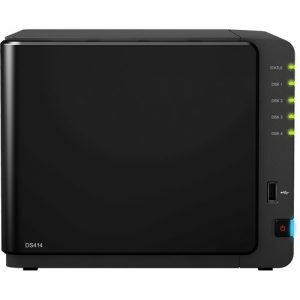 The DS414slim NAS Server from Synology comes equipped with a 1.2GHz Dual Core processor and 512MB of DDR3 RAM to maintain efficient data transfer speeds. With two USB 3.0 ports you can connect this enclosure to your Windows, Mac or Linux based system. 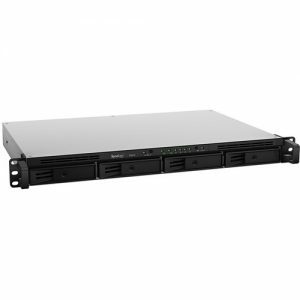 This enclosure can also be connected to the Internet via the included dual Gigabit Ethernet ports making your stored data available to users throughout the network. Files can also be made available remotely through the free iOS and Android applications. 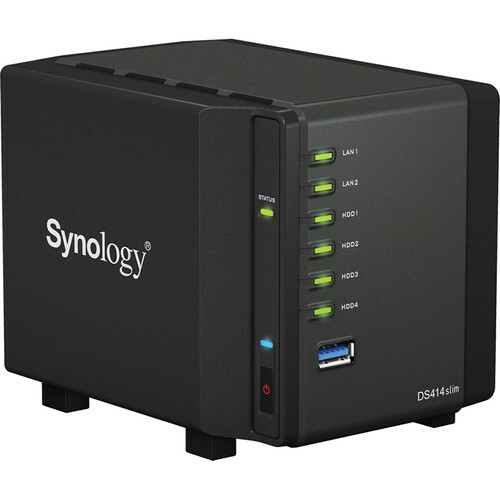 Whether using this Synology at home or in the office you can take advantage of a variety of tools including USB printer sharing, a dedicated mail service provider and VPN functionality, and even cloud storage support through Amazon S3 and Glacier cloud services. 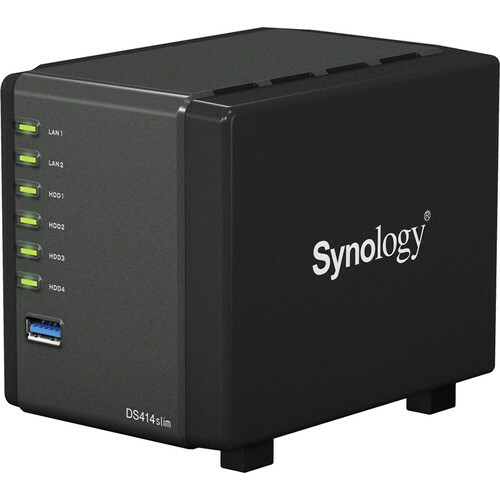 Along with the various business oriented functions, this Synology enclosure also supports HTTPS, firewall, and IP auto-block features for added security. The Synology DS414slim comes equipped with dual LAN for failover and Link Aggregation support, as well as two USB 3.0 ports to boost transfer rate between external storage devices. With data read speeds of over 110.91 MB/s and data write speeds of over 54.53 MB/s, the DS414slim is capable of handling some of the most data intensive tasks. With the detachable fan module, fan replacement has been greatly simplified, while the snap-in drive trays make disk installation fast and neat. 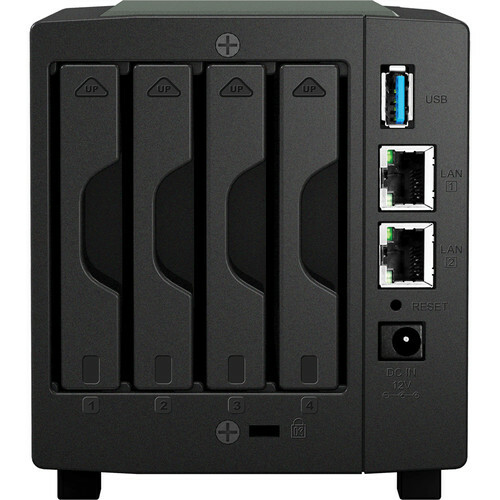 Running on Synology’s DiskStation Manager (DSM) operating system, DS414slim is capable of utilizing a variety of applications available in DSM Package Center. 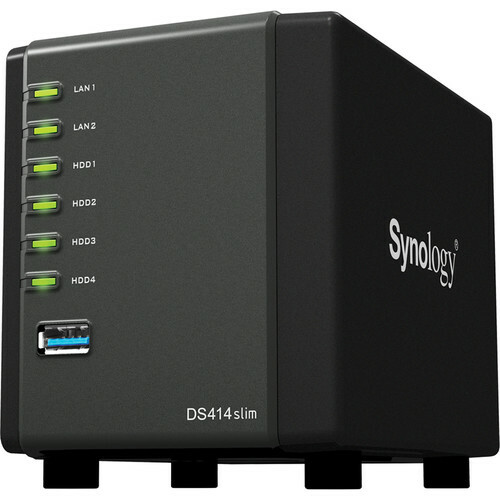 Synology DS414slim offers enhanced network protocol support, with seamless file sharing across Windows, Mac, and Linux platforms. Internet file access is simplified by the encrypted FTP server and the web-based file explorer, Synology File Station. HTTPS, firewall, and IP auto-block support ensure file sharing over the Internet is protected at a high security level. Cloud Station allows users to sync files among multiple devices, including Windows PC, Mac, Linux, iOS and Android tablets or phones, effortlessly keeping everything up-to-date. Cloud Sync brings your Dropbox, Google Drive and Baidu storage in sync with your personal cloud at home on DiskStation. Windows AD and LDAP integration allows Synology DS414slim to fit quickly and effortlessly into any existing network environment, with no need to recreate user accounts. With the DS414slim you can easily manage your multimedia contents and share them across Windows, Mac, and Linux platforms. Photo Station’s intuitive design allows you to organize photos into customized categories, smart albums and blog posts, and link them to social networking websites like Facebook, Twitter, Flickr, and Weibo within a few clicks. Audio Station comes with built-in lyrics plugin, Internet radio, and support for DLNA, AirPlay, and Bluetooth speakers for quality playback. With Video Station, you can watch movies and TV shows online or record your favorite programs with a DVB-T, DVB-S and DTMB tuners. Synology provides mobile applications that allow you to enjoy the full variety of your multimedia library even when on the go, allowing you to reach for your private albums, music and video collection at home in DS414slim. Available on iOS, Android and Windows Phone platforms, DS photo+, DS audio, and DS video mobilize your Photo Station, Audio Station and Video Station, placing terabytes of content at your fingertips. What’s more, DS download makes it possible for you to manage and monitor your download tasks remotely while you can access DS414slim content with DS file whenever required. 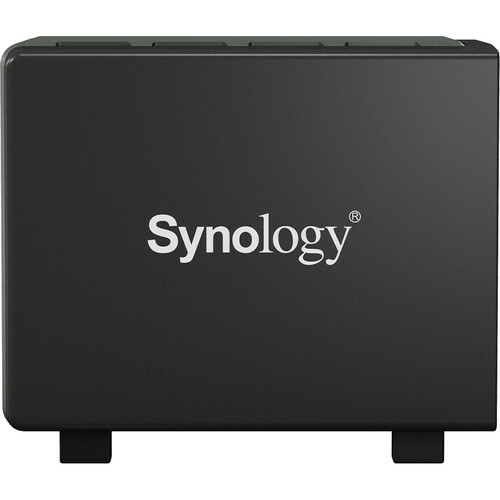 With a Synology DS414slim your data is safe. 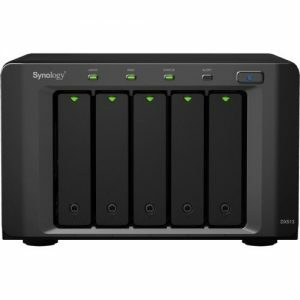 Server backup backs up your data to another Synology NAS, an external hard drive, or to any other Rsync server. With the help of multiple version control, you can restore your DS414slim to any particular point in time, free of worry about storage consumption because only modified data blocks are saved between versions. 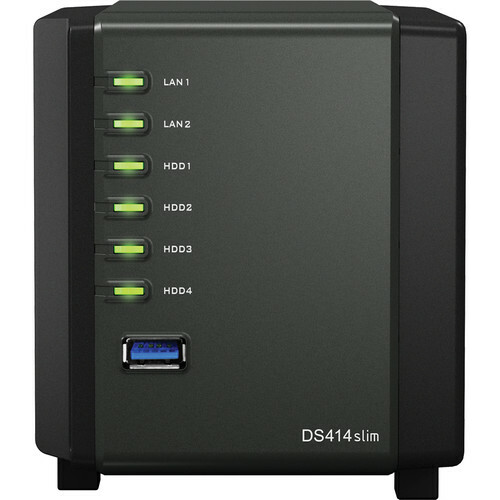 The DS414slim also serves as the centralized backup target of your computers in the house. 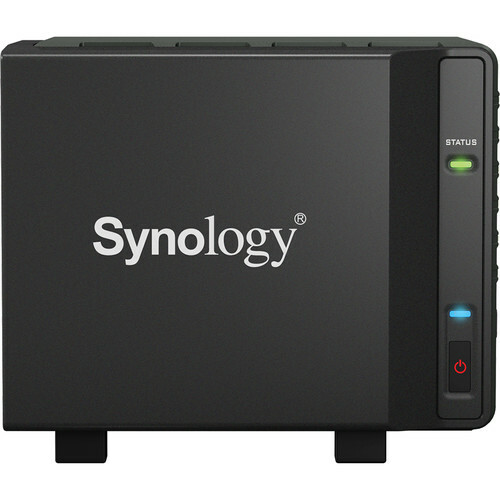 PC Users can back up their data to the DS414slim using the free Synology Data Replicator software, while Mac OS X users enjoy native Apple Time Machine integration. All Synology NAS is designed with energy efficiency in mind. Not only does DS414slim provide a 60 X 60 mm fan and the smart airflow to keep the system running cool 24/7, its noise dampening design makes it really quiet compared to PC counterparts. The support of Wake on LAN/WAN, multiple scheduled power on/off can further reduce power consumption and operation cost. All Synology products are produced with RoHS compliant parts and packed with recyclable packing materials. Synology acknowledges the responsibility as a global citizen to continually work to reduce the environmental impact of every product produced.